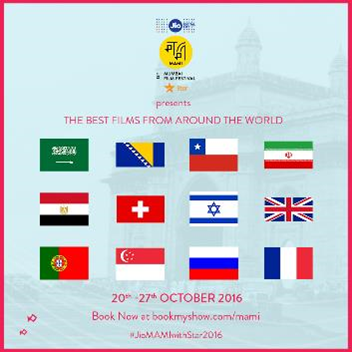 The Jio MAMI Mumbai Film Festival with Star is known to bring some of the most promising films to the country. This year too, at its 18th edition, the Festival will bring 12 stunning films, submitted for the most prestigious award in the world, the Academy Award. These films are from 18 countries and in 10 foreign languages. The films will be screened in India for the first time at the festival which is set to kick off on 20th October, 2016. Directed by Academy Award-winner, Asghar Farhadi, The Salesman revolves around a young couple, Emad and Rana who are forced to move into a new apartment when their old flat is damaged in Tehran. An incident linked to the previous tenant begins to dramatically influence the couple’s life. Director Asghar Farhadi made his first short film at age 13 in a youth cinema club and made various short films before going to the University of Tehran in 1991 to study theatre, a choice that would later influence his filmmaking style significantly. In 2011, he directed A Separation, which won the Golden Bear at the Berlin Film Festival and the Academy Award for Best Foreign Language Film. Mohamed Diab is an award-winning writer and director whose work is centered on issues concerning Egyptian society. He is known for his directorial debut, Cairo 678 (Les Femmes du bus 678), a story about three women who fight male chauvinism in Cairo. Diab’s second film Clash (Eshtebak), was selected as the Opening film of Un Certain Regard in Cannes Film Festival 2016. In a time when traditions walk side by side with smartphones and social medias, Barakah, a funny and improbable municipal agent responsible to enforce order in town, will meet a beautiful erratic ultra-famous Instagram video blogger. The unthinkable happens: they fall in love and will try to have a proper date against all odds. Sarajevo‘s Hotel Europe is bustling in preparation for tonight‘s European Union gala for the centennial of Archduke Franz Ferdinand‘s assassination. But the disgruntled staff plans to strike because they haven‘t been paid for two months. If this prestigious political dinner fails, the already mortgaged hotel will be shut down by the bank. However, the staff union rep soon goes missing. Dedicated and pretty chief receptionist Lamija’s mother Hatidza, of the laundry room, is elected strike leader while Lamija tries to keep everything running smoothly. As wedding festivities get underway in a Bedouin village in Israel, Jalila finds herself in the awkward position of hosting her husband Suliman’s marriage to a second, much younger wife. During the celebration, Jalila stumbles across eldest daughter Layla’s involvement with a boy from her university – a strictly forbidden liaison that would shame the family. Burying the indignity of Suliman and his new bride living next door, Jalila also tries to contain Layla’s situation by clamping down on her. Younger and possessed of a boundless spirit, Layla sees a different life for herself. Director Elite Zexer’s previous films include the shorts Take Note (2008), which won the Best Fiction Film Award at the Tel Aviv International Student Film Festival, and Tasnim (2010), which participated in over 120 film festivals around the world and won several international awards. Antonio Lobo Antunes life is brutally interrupted when he is drafted into the Portuguese army to serve as a doctor in one of the worst zones of the Colonial war – the east of Angola. away from everything dear he writes letters to his wife while he is immersed in an increasingly violent setting. while he moves between several military posts he falls in love for Africa and matures politically. at his side, an entire generation struggles and despairs for the return home. in the uncertainty of war events, only the letters can make him survive. ‘Paradise’ reflects on a twentieth century filled with great illusions buried in ruins, the dangers of hateful rhetoric and the need for mankind to use the power of love to triumph over evil. Revolving around a ten-year-old boy nicknamed Zucchini, who is taken to live in an orphanage following his mother’s death, the movie tells the story of how he will overcome the obstacles and fit into this new environment, surrounded by a small group of children who, just like him, have been scarred by life. Tehran, 1988: The Iran-Iraq war rumbles into its eighth year. The bombing campaigns focused on the city, coupled with the country’s bloody revolution, slowly tear a mother and daughter apart. As they struggle to stay together in the midst of these modern terrors, a mysterious evil stalks through their apartment, threatening their grip on reality. Michèle seems indestructible. Head of a leading video game company, she brings the same ruthless attitude to her love life as to business. Being attacked in her home by an unknown assailant changes Michèle’s life forever. When she resolutely tracks the man down, they are both drawn into a curious and thrilling game—a game that may, at any moment, spiral out of control.